Opening my wax seal (not had one of those in ages) and the juniper is front and centre, it smells intense. I’m not picking up any citrus or spice yet. In the glass you definitely know it is navy strength (fun story: the boy sniffed the bottle and said there wasn’t much there, he changed his mind very quickly when he smelt it from the glass). There’s hints of peppery spice and a smoothness of vanilla lurking there. Adding a splash of water keeps it clear, no louching here! The smell changes a lot, the harshness of the 57% ABV dies down and instead you get a softer smell, hints of citrus coming through at the very edges but on the most part very clean. On the tongue you get instant pepper that lingers long after you’ve finished the mouthful. I don’t think I would guess that it is a navy strength gin though. The boy thinks there is a thickness to it and it is reminiscent of an old fashioned sweet, but not entirely sure why. On the second go I understand the thickness, but in a smooth way – like an almond milk. The pepper fades away after the initial burst but keeps a warmth to it. Mixed with some Fever Tree light and it louches ever so slightly – before it was crystal clear and now it’s on the clearer end of translucent. 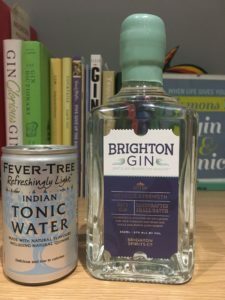 I would say their description of the flavour is fairly accurate – you get the tang of citrus before a wave of juniper which leads into a tingle of pepper. I don’t fully know if I would guess this is navy strength – this is a problem I have with stronger gins, the extra juniper just makes me think it is a proper gin and tonic. This, is a delight. As is their regular gin. 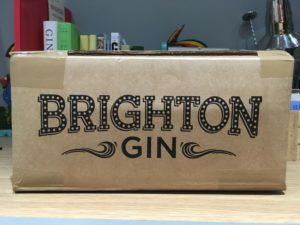 I don’t have much more to say other than damn I love Brighton Gin. Adding a splash more tonic (originally 50ml gin to 50ml tonic and now upped to 100ml tonic) and the citrus takes over from the pepper as the dominant flavour. With less tonic, the flavours are more balanced, but here the sugary sweet notes come forward. Adding a slice of lime as suggested doesn’t add much in my opinion. As the citrus is stronger when you dilute it further, the lime only enhances this. Perhaps adding lime when it was more concentrated would have helped balance the flavours. 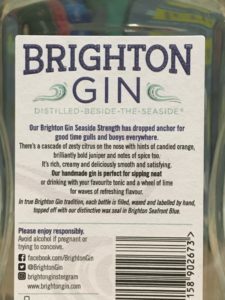 Currently the Seaside Strength gin is only available in certain shops in Brighton and Hove or via their website here for £47 (at time of writing). Navy strength gin usually comes at a higher price – you get more ABV for your money – and this is one I think I would happily invest in. You can find Brighton Gin on Facebook, Twitter and Instagram. 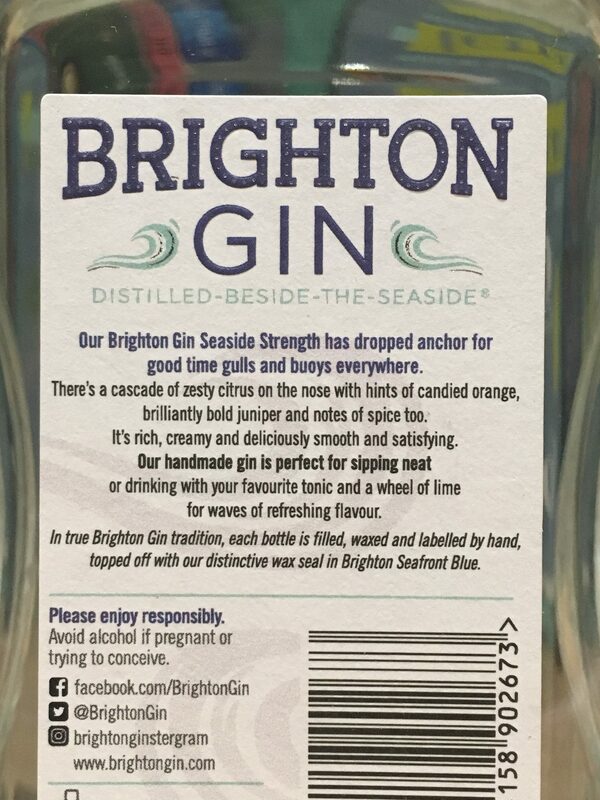 Have you tried Brighton Gin or the Seaside Strength? Let me know your thoughts on Twitter and Instagram. 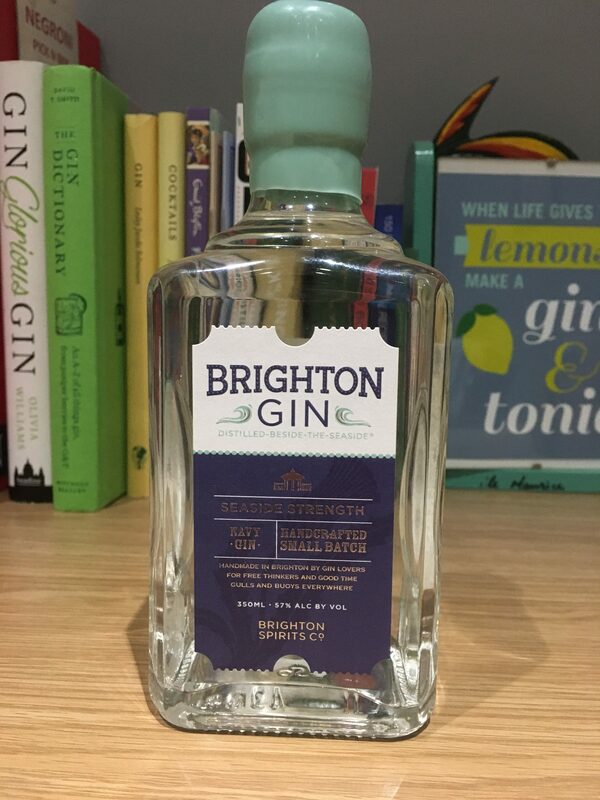 I really like Brighton Gin, but alas have just finished the bottle I got for Christmas. I’d be interested to try this one, although these days I am looking for less alcohol, not more. Maybe they will being out a lightweight version too? Anything below 37.5% isn’t legally gin so if they did produce this it would have to be a gin liqueur or juniper flavoured drink rather than a gin per say, or try mixing it into a longer drink with plenty of ice to help lower the alcohol content? I recommend trying this though, it is a delight.